“The best cookbooks are storybooks…When all the dishes have been cleared from the table, these recipes remain, a tangible link to a time, place, a people.”-John T. Edge. If it is true that the best cookbooks are storybooks, it is no surprise the “Southern Grace Recipes & Remembrances from The W” is on its way to becoming a best-seller! “Southern Grace” brings time-honored recipes and contemporary Southern cuisine together in a book that reflects the rich traditions of Mississippi University for Women. The recipes featured in “Southern Grace” are favorite recipes submitted by MUW alumni and friends, but the final selections were made by the MUW Culinary Arts Institute, which tested and rated each recipe submitted. The cast of characters in “Southern Grace” is as magnificent as the food. Eudora Welty’s description of her days at MUW, the ghostly tale of Miss Callaway in the Clock Tower and Gail Ferguson Laws’ “97 encounter with “macho strawberries” take you on a journey through the years at MUW. And all great storybooks have pictures! The exquisite photographs in “Southern Grace” make your mouth water for the delectable fare and your heart yearn for a visit to the beautiful campus of MUW. 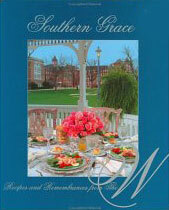 “Southern Grace Recipes & Remembrances from The W” is the perfect gift for any occasion, so go ahead and order several to have on hand for birthdays, weddings and other special occasions! And remember, proceeds from the sale of “Southern Grace” are used to provide student scholarships and to further alumni goals and projects helping to ensure more success stories from MUW.